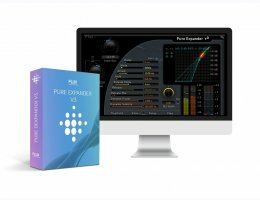 Pure Expander is a powerful versatile processor capable of anything from mild expansion to hard noise gating, perfectly suited for soft downward expansion. It can clean up spillage on (live) recordings, remove noise, reverberation and leakage from drum sessions. Pure Expander is designed to automatically reduce the gain below the threshold, providing full control over the incoming audio signal. In addition to the more common dynamics processing controls (ratio, attack, release, etc), Pure Expander v3 provide control over the essential dynamics profile it uses, all in order to offer the user full control over the processing even in the most demanding situations. Pure Expander provides parameters are provided that are unique in dynamics processing; Dynamics Ratio and Level Independent Detection (L.I.D), using the dynamic range content of the signal and not just the signal levels as standard processors do.Pure Expander V3 comes from the expander section of Solera. It uses the exclusive Angel's Share and Hysteresis algorithms developed by FLUX::. The exclusive "Angel's Share" algorithm developed by FLUX:: allows you to remove unwanted noise or reverberation without adding a processed character to your sound. A Hold parameter and a Threshold for Hysteresis, are also provided. Classic modes and Feedback modes are now available for signal level detection, completing the legacy Solera mode. Various other new profiles can be selected for detecting the dynamics of the signal. A Maximum mode can be engaged on the Hysteresis control, allowing processing that takes into account maximum values of both the standard and the Hysteresis detection schemes. An exclusive A / B morphing system, allows instant, efficient and global control of processing. The preset manager allows you to save global presets made up of two different presets including the A / B morphing slider position. Note also that factory presets are provided for every plug-in. Pure Expander V3 is available in AU / VST / AAX Native / AAX DSP / AAX AudioSuite / Waves SoundGrid.